Nobody wants to think about the air conditioning system in their home breaking down on the hottest day of the year. But if it happens to you, you should know you can count on Boelcke Heating and Air Conditioning to help. We strive to get your system back up and running quickly, so you and your family will be back to enjoying cool comfort in no time. Our skilled technicians are able to provide AC repair on virtually any make or model of cooling system. They’ll thoroughly troubleshoot your system, quickly discover where the problem lies, and then make the necessary repairs to your system. They’ll also let you know if a repair isn’t feasible, and help you with an air conditioning replacement. We strive to ensure complete comfort for your and your family, all summer long. Get the air conditioning repairs you need and more from Boelcke Heating and Air Conditioning. 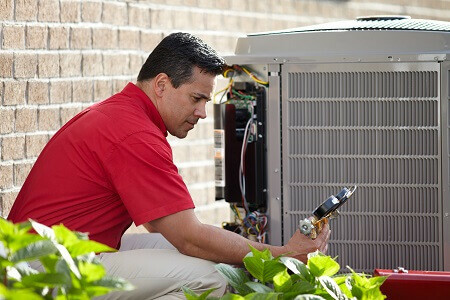 AC Maintenance: There is nothing better for your air conditioning system than annual maintenance. Your system will work at peak efficiency year in and year out, and experience considerably fewer breakdowns. New AC Installations: At Boelcke, we pride ourselves on providing our clients with the best air conditioning products on the market, installed to perfection by our skilled technicians. Ductless AC: If you need to cool a space in your home, but ductwork is impossible or impractical, we have a solution for you. Ductless air conditioning can help you get the cooling you need, without the ductwork! When you need air conditioning repair from a qualified cooling specialist for your home, you can trust Boelcke Heating and Air Conditioning. We can help meet all your AC needs, large or small. Simply give us a call at (269) 429-9261, and we will be more than happy to assist you. The Man, Kevin who installed our furnace was a very good service/installer and your company should feel fortunate to have him. Very rare these days!